Who doesn't like free food? 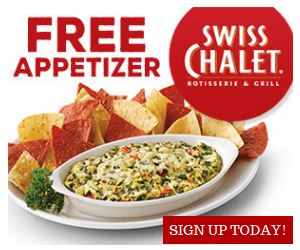 Sign up to receive Swiss Chalet Rotisserie's E-mail and you'll receive a coupon for a free appetizer! Share this offer with your friends and family! If you like this offer, check out another one we posted for free food at Montana's! Want more restaurant deals and freebies? Check them out here!